Looking for a New Toyota Corolla in your area? 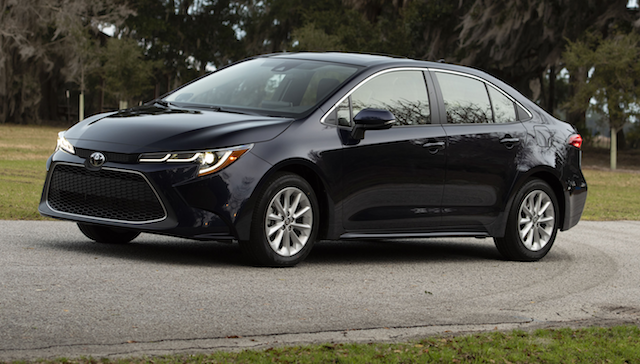 CarGurus has 1,301 nationwide Toyota Corolla dealers with 66,459 new car listings. As one of Toyota's compact sedans, the Corolla has made a name for itself by holding steadfast to its focus on reliability, affordability, and fuel efficiency. For 2020, Toyota introduced a brand-new Corolla with improvements in nearly every area. It competes with the likes of the Hyundai Elantra and the Honda Civic. Other than the general profile, the new Corolla’s exterior takes little from its predecessor. While the distance between the front and rear wheels remains unchanged, the front and rear tracks are wider, and the hood and overall height are lower. The drastic front end borrows its three-element headlights and fenders from the recently released Corolla Hatchback, but the lower grille is unique to the sedan and looks menacing in any guise. The Corolla’s side profile is handsome, if straightforward, with extra visibility afforded by additional side glass and relocated mirrors. The rear end provides an elegant conclusion to the car’s shape. The L, LE, SE, XLE, and XSE grades all return for 2019, and Toyota promises unique exterior styling details for the sportier SE and XSE trims. Much of the Corolla’s interior, including the entirety of the dashboard, is lifted directly from the Corolla Hatchback. There’s little to distract you from the dashboard’s most important zones: the instrument cluster, the infotainment system, and the climate control panel. The Corolla L, LE, and XLE trims benefit from a 1.8-liter inline 4-cylinder engine, carried over from the previous model. Toyota doesn’t specify the power output, but notes that it’s better than last year’s 140 horsepower and 126 pound-feet. Meanwhile, there’s now a second engine choice: a brand-new 2.0-liter inline 4-cylinder unit with 169 horsepower and 151 pound-feet of torque. Both engines pair with a 6-speed manual transmission or a new continuously variable automatic transmission (CVT). Finally, Toyota thoroughly reworked the Corolla’s suspension, replacing last year’s cruder torque-beam system with a multi-link rear suspension, which should provide a sportier and more-premium set of driving characteristics. Fuel-economy figures range: With the manual 6-speed, the 1.8-liter engine will return 29 mpg city, 39 highway, and 33 combined, while the 2.0-liter engine will return 29, 36, and 32. With the automatic and the 1.8-liter, expect 30, 38, and 33, while the 2.0-liter will get 31, 40, 34. The SE trim is available with either a CVT, which returns 31, 40, 34, or what Toyota calls an "intelligent manual transmission," which will get 29, 36, 32. The new Corolla is full of new features. Even the base L trim gets keyless access and start, 16-inch steel wheels with covers, LED exterior lighting, a 4.2-inch instrument cluster LCD, a 7-inch touchscreen infotainment system, and cloth upholstery. Other trims get 16- or 18-inch alloy wheels, a 7-inch instrument cluster display, an 8-inch infotainment system with Apple CarPlay, Siri Eyes Free, dual USB ports, navigation, and JBL premium audio, along with leatherette upholstery in one of several two-tone combinations and adaptive LED headlights. The entire Toyota Safety Sense 2.0 suite of safety features comes as standard equipment across the trim lineup, bundling a reversing camera, forward-collision warning with automatic emergency braking and pedestrian detection, adaptive cruise control, lane-departure alert, lane-keeping assist, lane-tracing assist, automatic high beams, and traffic-sign recognition. The only optional feature is blind-spot monitoring with rear cross-traffic detection. There’s no public crash-test data for the Corolla available as of this writing. The 2020 Corolla offers more choice, from engines to colors to styling. Toyota has changed just enough here to keep the Corolla competitive without abandoning the values that it holds dear. Look for the car’s release in the spring of 2019. What's your take on the 2020 Toyota Corolla? Have you driven a 2020 Toyota Corolla? Enter your zip to see incentives for a new Corolla in your area. My cars radio is all static when my headlights are on? How can I fix this?